Tonight was a chill kind of evening, after coming in from a late showing down in McDonald County. The kind of night where comfy pjs, candlelight and a movie are the perfect ending to the day. My daughter Elissa recommended a movie to me, based on my enjoyment of films about cooking. I settled in to watch. 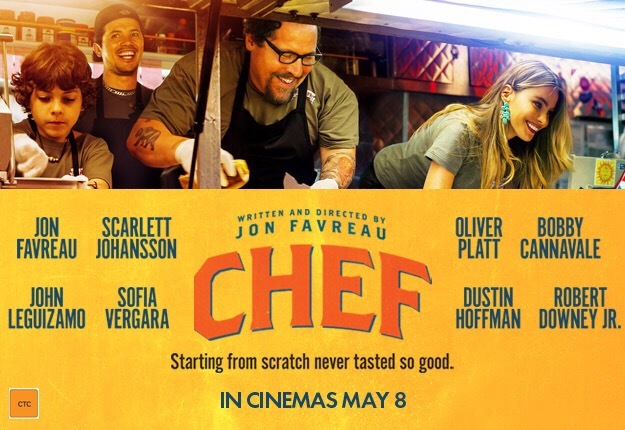 Chef stars Jon Favreau, Sofia Vergara, John Leguizamo, Oliver Platt, and Emjay Anthony, with cameos by Dustin Hoffman and Robert Downy Jr. This drama/adventure was written and directed by Jon Favreau and carries an R rating, for language. The movie has a run time of 1 hour and 55 minutes. Chef Carl Casper (Favreau) is king of his kitchen at a prestigious restaurant in LA, a position he has maintained for 10 years. His standard menu pleases the clientele, but Carl is bored and ready to allow his creativity and expertise to direct him in preparing a fresh, exciting menu. The restaurant owner (Hoffman), disagrees. 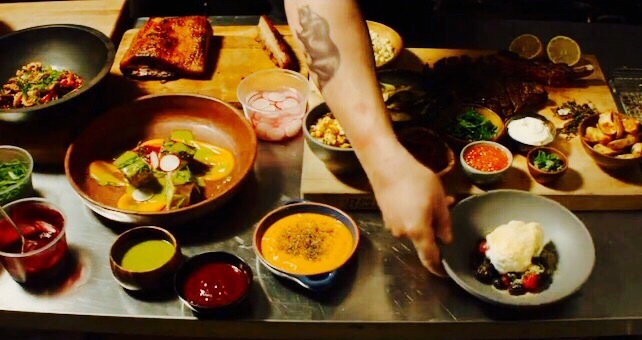 Even when food critic and blogger Ramsey Michel (Platt) schedules a visit, the controlling owner demands Chef Casper and his staff play it safe. Michel blasts the restaurant and Chef’s unimaginative fare via Twitter, and the social media war is on! Carl leaves the restaurant, refusing to be limited, refusing to play it safe, and goes viral online when he mistakenly sends a Twitter tweet aimed at the food critic, thinking it is a private message. When no other restaurant will take a chance on him, Carl goes to Miami, Florida with his ex-wife, Inez (Vergara), and his 10 year old son, Percy (Anthony). Carl hopes to spend time with the son he has neglected, but Inez has an additional intention. She sets up a meeting with her second ex (Downey, Jr), who has an idea. He envisions Carl serving hungry patrons from a food truck. Having nothing to lose, Carl accepts the battered truck. 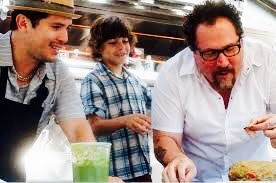 With his best friend, and sous chef, Martin (Leguizamo), and his son Percy, Carl treks across the US from Miami to LA, stopping in cities en route to offer Cuban sandwiches, yucca fries and a variety of original, tasty foods. The cleaned and refurbished food truck draws a crowd wherever it stops, primarily due to Percy’s social media skills. It’s a journey into his unleashed creativity for Carl, that forges a stronger relationship with his son and estranged wife. This was a heart warming movie. The language is strong, deserving the R rating, but worth overlooking for me. I enjoyed another peek into a chef’s kitchen, realizing for the first time that cooking is a lot like gardening. A cook is happiest when he is getting his hands dirty, arms elbow deep in dough rather than soil, fingers used as deftly as cooking utensils to grab a pinch of spice or bring a sample of sauce to the mouth for a taste. There the comparison ends. I don’t sample the dirt in my garden. I loved the artistic side of cooking, the ingenuity, the desire to create something new. What I appreciated about this film was that it departed from the typical French chef wannabe story. Carl was more earthy, influenced by New Orleans, Cuba and Texas barbecue. He traded his kitchen for a truck, when it meant he could explore his culinary talents and work for himself. Most of all, I enjoyed the interaction between Carl and his son. Too busy and distracted to pay the boy much attention when he was a Chef, Carl was missing his son’s life and his heart. Percy wanted to explore cooking as well, eager to learn, and even more eager to spend time with his dad. Their voyage across the US was so much more than getting the truck home to LA. It allowed the two to find common ground in their shared love of cooking and truly get to know each other. Two thumbs up for this fun movie. And another nudge to explore my own latent interest in the culinary arts. Cooking class, anyone?